Figures published this week by INSEE showed that confidence in the retail sector was on the rise in November after a disappointing October survey. If retailers continue to be more pessimistic about the general economic outlook, they still expect better sales for the end of the year. Hiring expectations are also on the move. However, the survey was conducted before grassroots protests blocked hundreds of supermarkets on 17 November, causing shopping traffic to drop by 39% (according to the Council of National Shopping Centres). We think it could affect the December survey results. But the movement will probably abate in coming weeks as oil prices recede on international markets so we don't expect an impact on private consumption. Numerous strikes and several days of paralysis cut 0.1 percentage points off GDP growth in 2Q but we are still far from this in the “yellow vest” protests case. That said, the fact that the movement could be used and fuelled by both extreme right and left political activists could extend it and ultimately impact consumption. 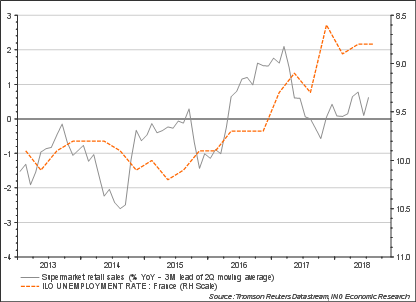 The fact is that supermarket sales are already weak despite an improvement in unemployment in the last two years (8.8% in 2Q in metropolitan France). If the sector is indeed to create more jobs, as intended in the surveys, it needs consumers inside the shops, not outside around a brazier. We revised our GDP growth forecast down to 1.6% in 2018 before slowing down further next year to 1.4%. The same INSEE survey showed that confidence was increasing in the building sector where hiring intentions and expected activity was still on the rise despite record-high capacity utilisation. In the service sector, confidence remained stable at 103 in November, a level last seen in the summer of 2017 when it was the highest in six years. Confidence therefore remains relatively high, with a stable investment outlook and more optimism for future demand. However, we note that hiring expectations reached their lowest level since April 2015. The recent trend was also less dynamic than expected, something that we will measure in the unemployed population count published early next week. In manufacturing, confidence showed a slight rebound from 104 to 104.8 in November, consistent with levels last seen in the early stages of the short recovery two years ago. Inventories were stable while both recent and expected production were on the rise. We note however that foreign orders, which remained elevated until last month, are also declining while domestic order books have suffered from weak domestic demand. This could hamper an acceleration of the current business investments recovery. All in all, the November confidence surveys confirm that the 4Q GDP rebound could be more limited than expected. Private consumption growth should decelerate from the already weak 1.2% reached in 2017 and we have revised our GDP growth forecast for 2018 to 1.6% before slowing down further next year to 1.4%.